Nankhatais are buttery cookies that simply melt in the mouth. Though I had a lot of choices for the Letter N, I picked this simple delight since I haven’t made these before. After making the delicate Macs, the Nankhatais were a breeze to make! The word Nankhatai is derived from Persian word Naan meaning bread and Afghan word Khatai meaning Biscuit. In Afghanistan and Northeast Iran, these biscuits are called Kulcha-e-Khataye. Kulcha is a type of bread similar to Naan. Nankhatai is believed to have originated in Surat, Gujarat in the 16th century,the time when Dutch and Indians were the important spice traders. A Dutch couple set up a bakery in Surat to meet the needs of local Dutch residents. When the Dutch left India, they handed over the bakery to an Iranian.The bakery biscuits were disliked by the locals. [To save his business he started selling dried bread at low prices. It became so popular that he started drying the bread before selling it. With time, his experimentation with bread ultimately gave birth to the Nankhatai. Though these biscuits were brought into India by the Dutch, they are very popular and widely known across the country. Cream butter until smooth, for about 20 seconds. Add the vanilla extract, flour, semolina and sugar. Beat for a minute until it forms a dough. Divide into two and pat into discs or logs. Wrap tightly in plastic wrap and refrigerate for 30 minutes to an hour. If you made logs, you can slice these cookies gently and place on the baking sheet. If you made a disc, you can roll out the dough into ¼ inch thickness and use a round cookie cutter to cut into circles. Place the cookies on prepared baking sheet and chill for 20 minutes. Using a sharp knife make a small criss cross on the top. Sprinkle a pinch of cardamom powder on the cross. Bake for 11-13 minutes. The cookies will still be soft when done, the edges will be golden brown. Carefully transfer cookies to a cooling rack using a spatula. Press a pinch of chopped pistachios on the cross while the cookies are still hot. Cookies will harden once cooled completely. Enjoy these scrumptious melt-in-the-mouth Nankhatais! I see a second version of Nankhatais , equally stunning . Beautifully baked and drooling over these. 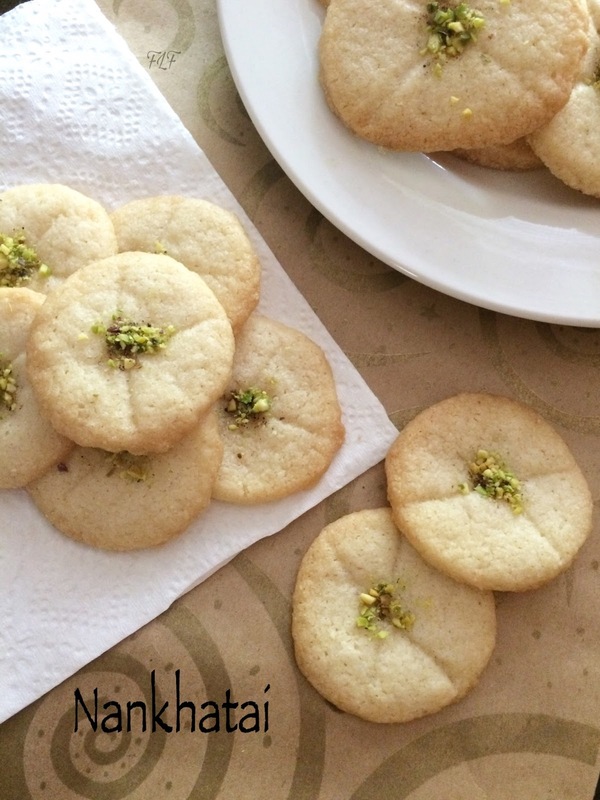 Super like and beautiful baked nankhattais, never get bored of this butter cookies. You are tempting me to bake some rite now. They come out perfect each and every time. Our family fav too! Well after macroons everything is easy hehehe..these look so delicious Nams. We need to some easy ones to bake/cook during this mega BMs... As Valli mentioned, after macroons this one would have been an easy peasy one. Lovely looking nankhatai. I'm loving the stories you are sharing with every dish -- that is lot of research you have done. I love nankhatai and yours looks amazing. This is in my to-do list for a long time now... Need to try it out. Yours has turned out too good. Ever delicious and awesome cookies! !